Home Apps What is mobility as a service and how could it benefit the UK rail network? The capacity crunch is not a UK-centric problem; nor is it an issue specific to the UK rail network. Globally, there has been a monumental shift in how people are choosing to live and work. Urbanisation is putting a strain on almost all modes of transport: trains are overcrowded, and railways are ageing. Congestion halts the road and oftentimes, transport is at a complete gridlock. The pressure on the UK’s transport infrastructure networks is mounting, and capacity is almost at critical levels. These pressures need to be alleviated as a matter of urgency. Luckily, innovators, digital disruption and great ideas are not in short supply. Driverless cars, high speed trains and even high-speed aeroplanes are taking giant leaps for mankind to tackle the capacity crunch. However, these innovations are slower and costly to create and maintain. Indeed, they are also relatively untested means of transportation; bringing these to market would take too long to tackle the issues at hand. We need change now – but how do you solve a problem like capacity? Mobility as a Service – also known as Transportation as a Service – is becoming a vital disruptor in the transport sector. Representing a complete shift in how people interact with, use and consider their transport options, Mobility as a Service sees users buying transport options in bundles, via smartphone apps. The phrases ‘on demand’ and ‘as a service’ are almost synonymous with modern living. The advent of the smartphone, and increasing prevalence of social media, digital communications and the internet – as well as the availability of products, information and content 24/7, has seen an explosion in digital disruption being seen across all industries. For example, when Netflix was first invented back in 1997, the way in which users consumed entertainment was transformed. While originally, Netflix was not the platform it is today, it was still a massive step forward in how audiences consumed entertainment. Before Netflix, there was a very specific method to how we were expected to consume televised entertainment. The content we enjoyed was available to us only on a certain channel, on a certain day, at a specific time. We were expected to watch programmes as they were broadcast, and there was no autonomy to our viewing preferences. Netflix changed that: users were no longer bound by the stipulations set out by the television networks or broadcasters; we could watch what we wanted, when we wanted to. By tackling the issue of exorbitant cable/television/broadcasting companies, Netflix disrupted the service and function of an entire market; people were offered an alternative – something that catered specifically to user demand. Other companies have also been able to emulate this success in different areas of industry. Uber, for example, transformed the car summoning industry with a ground-breaking, yet simple idea: big data analytics. Using the power of the smartphone and the accompanying app, Uber was able to connect with users directly, and offer an on-demand service never before seen: the taxi industry was entirely disrupted. As time went on, Airbnb became the on-demand rental service. JustEat, Hungry House and Deliveroo are now the go-to for on demand food. There are an increasing abundance of on-demand apps that have taken inspiration from Netflix and Uber’s ground-breaking business models – digital disruption is spreading across almost all industries. The rail industry on demand? Historically, the UK rail industry is not one renowned for its flexibility; an industry often bound by its long and proud traditions, transformation has been slower than in other areas of transport. While the UK rail network has come on leaps and bounds, the concept of an on-demand rail service is still placed firmly in fiction: how could the rail network apply Netflix or Uber’s business model to the rail industry? Across Helsinki, Amsterdam and Antwerp – and most recently, a trial run in Birmingham – residents are offered Mobility as a Service via Finland-based transportation disruptors, Whim. Anyone with a smartphone and the accompanying app, can enter a preferred destination and mode of transport (bus, train, taxi, car-share/bike-share or a combination thereof) with a variety of payment options available, and travel on demand. By integrating end-to-end planning and electronic payment across all modes of transport, the Whim app marks a revolution and genuine transformation with regards to how mobility is offered as a service in those cities. How could the UK rail network benefit from Maas? Of course, summoning trains like we do Uber taxis isn’t necessarily feasible – the rail industry is a fixed transport service, after all. However, there is definite room for significant industry disruption, fuelled by the spirit (so to speak), of Mobility as a Service. The rail industry can unlock a wide range of opportunities by focusing on its passengers, by adopting a user-centric approach: looking at MaaS opportunities for customers, as part of an industry-wide, integrated system that moves beyond a fixed transport service, and becomes something more flexible. Recently, five of OnTrac’s team members travelled down south to watch local heroes, Newcastle United, play Leicester. Using a popular website to purchase tickets, they were presented with the cheapest option and saved a lot of money in the process. 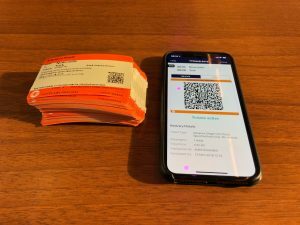 However, for a company that specialise in digitalisation and banishing paper from rail industry processes, the disappointment for us, was that it cost a small forest: our lads were presented with an eye wateringly staggering 81 tickets to print before they travelled. The spirit of MaaS disruption here would have been enormously beneficial for our lads. While digital-ticketing is offered (see above), doing so across the sector, especially in a split-ticketing landscape – would not only reduce the sheer cost (both in terms of money and the planet) in printing, it would also enable users to plan their end-to-end journeys independently; a flexible offering that focuses entirely on user demands. An app that would allow users to choose specific metrics based on preference (number of stations, comfort, time, cost etc. ), would allow the rail industry to start offering journeys that focus on specific customer outcomes, planned and delivered for specific customer circumstances: the rail industry as a service. Following in the footsteps of the wider transport sector, the rail industry can meet these trends head on. Taking steps to integrate the systems and focus on passenger experience will not just being meeting customer demands, but also bridge the gap between user expectations and industry reality almost instantly – leading to a clearly defined, smarter digital railway for all. Next article Is Choice More Important to Corporate Travelers?